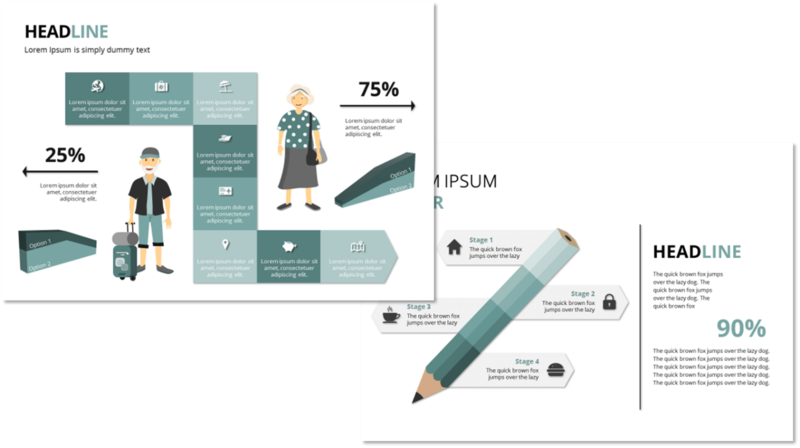 This guide intends to provide every resource you need when creating a Business PowerPoint Presentation. To address your needs, we've divided the guide into six sections. 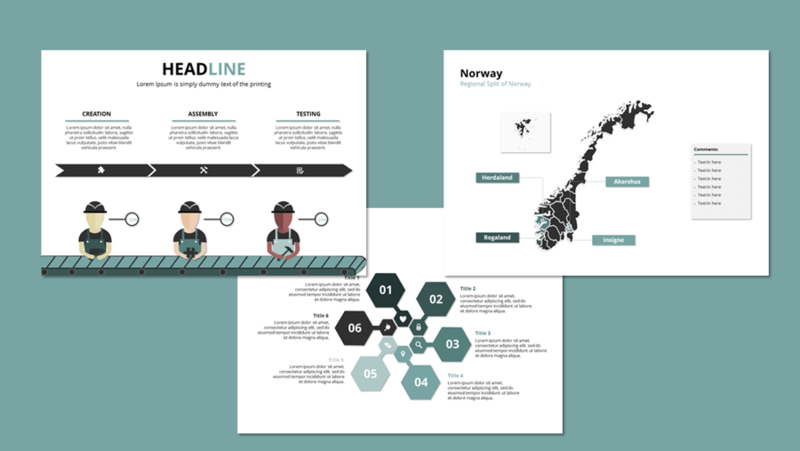 Every company needs a PowerPoint template that represents their visual identity. If you’re looking for inspiration and free creative PowerPoint slides, you can also pick and choose from more than 1000 premium slides from our inspiration library. Paste the slides directly into your presentation, and the colors automatically adjust to your default settings. All elements are completely customizable. Download the slides, edit elements, and excite your audience. Let’s say you’ve downloaded a great slide, but the colors do not fit your color scheme. Luckily, PowerPoint will fix it automatically once you paste it into your presentation. You can also change the colors manually for more creative control. And if you wish to add or remove an element, readjustment is super simple. Elements from other slides will seamlessly transfer by copying and pasting, and deleting will remove any unwanted elements. 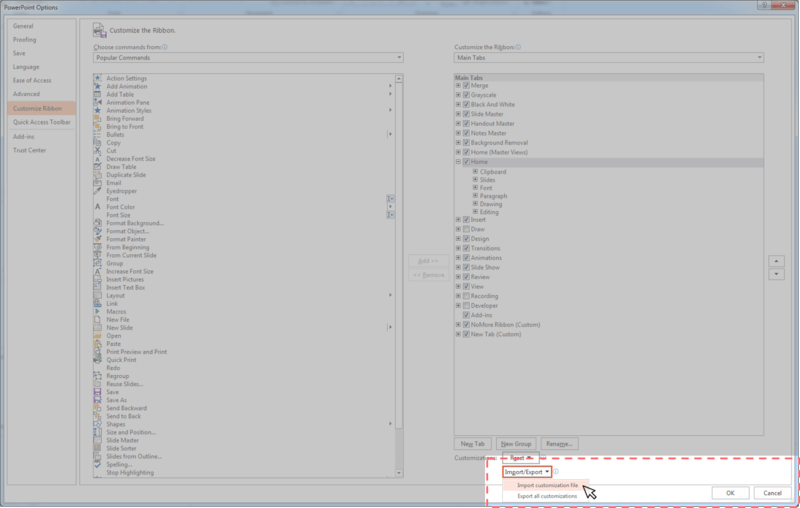 Resize elements with Ctrl + G to group them together, and modify them to your liking. Pasting information into premade slides is one thing; having the ability to create great slides from the ground, or changing the visuals of premade slides while still maintaining professionalism is another. Luckily, getting to know the latter is not difficult. But why do you need killer slides in the first place? You need to build trust to convince your client. A lousy PowerPoint distorts your message, making you look unqualified, unfit or incapable. If your slides look sloppy, your calculations might also be called into question. The fundamental principle of good presentation design is that it should support your message, not detract from it in any way. You (and your presentation) are aiming to convince the audience of something, whether you are selling a business, presenting a 2025 strategy or preparing for a boardroom meeting. You already know your objective. You probably also know how to communicate it using The Pyramid Principle. Obviously, you know the numbers. The presentation is the easy part. Just avoid mistakes and keep it clean and professional. Executive management don’t like inaccuracies because it prompts uncertainty – this applies to both calculations and business presentations. But what is professionalism and how do you avoid inaccuracies? Not necessarily. Take alignment; it is a law you must follow, like doing the same thing on both sides of an equation. Consistency across slides is also a rule, not an optional extra. But alignment is one thing, and style and preferences are another. There can be no doubt that style is more subjective and varies between clients. Yet, in no-more’s experience, most businesses are fairly reserved when it comes to design – when presented with several options ranging from artistic to conservative, our clients choose the latter 80% of the time. Don’t rock the boat unless that is your goal. Of course, there are exceptions, but using multiple contrast colors and multi-colored gradients just isn’t clean or professional. If you want to look professional, align all the elements in your slide deck. We know we are biased and have an incentive to raise awareness and create demand four our services, but alignment is among the most basic design principles, and you will find few business professionals who dispute that. Alignment alone will not win you the pitch or make you stand out, but cutting corners might just do the opposite. 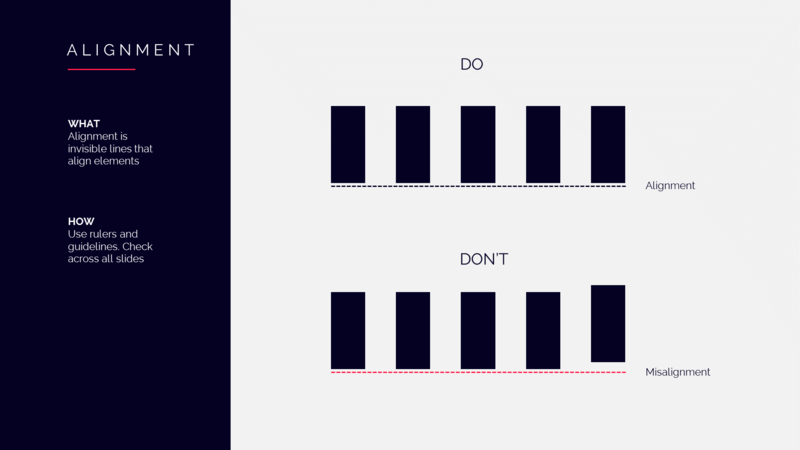 Alignment is easy to fix and improves the quality of your slides, providing you ensure consistency across all of them. Do all of your headers sit in exactly the same position, from one slide to the next? Do your graphs align with the first letter of your headers? Do your footnotes align perfectly with the rest of your content? There is no one correct way of aligning slides that exists in the world. But, one thing is indisputable: if your slides don’t align, it is easy to tell, and your presentation will suffer. You wouldn’t buy something from a poorly designed website, would you? Presentations are no different. It might take hours, but skipping this vital step will result in a presentation that creates a feeling of uncertainty in your client. Want to learn more about alignment and discover how to make killer business presentations? 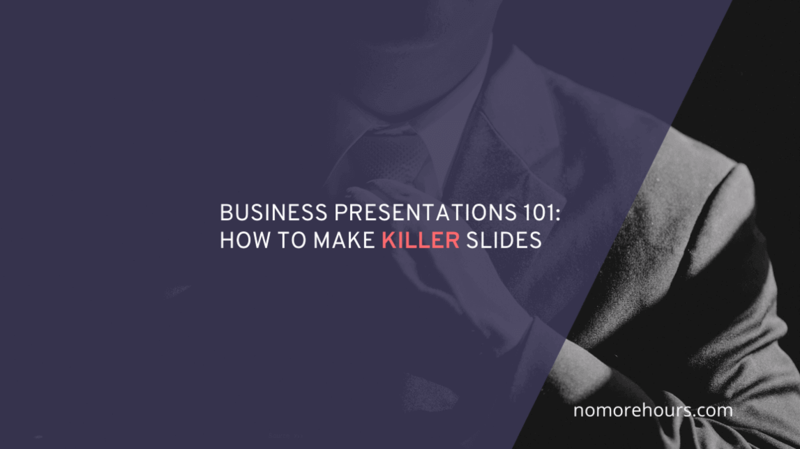 Hopefully, the ebook on how to make killer business presentations will help you wow your colleges and allow your messages to take center stage. Knowing the basics of business presentation design is a necessity – a hygiene factor – in most companies. What separates the wheat from the chaff is the ability to do visualize data in a convincing and simple manner. In today’s fast-paced world, you must get the right message across as quickly as possible. The last thing you want to be doing is losing valuable time explaining your findings because your data visualization wasn’t up to par. When presenting your findings, visualization is a vital tool to help decision makers reach the right conclusion, as quickly as possible. The quality of your graphs and charts is judged by how fast the audience reaches the conclusion you intended, and how well they understood the information you presented. You’ve spent hours gathering information, describing your data, analyzing and inferring. You (or somebody else) put in the hard work; now it’s time to deliver your point - in seconds. Decision makers are busy and eager to discuss conclusions and actions rather than methodology and academics. In general, they don’t care about your process or how many hours you put in; if your slides don’t illustrate your point, the hours don’t matter. This is why it is so important that the presentation of your data is simple. Support it with data-based arguments and proper visualization; it comes back to the hygiene of slides – a necessary evil. The question of when to use what can be difficult to answer, but the rules of thumb in this ebook will help you to avoid the most common pitfalls. 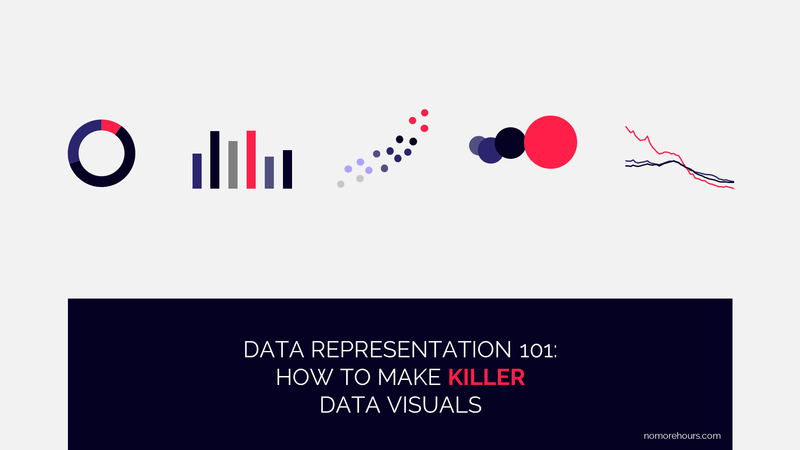 Let’s start out with the basics; the fundamentals you need to know before you level-up to advanced data visualization. A bubble chart is a scatter plot with an additional quantitative variable. The additional variable is represented by the size of each dot and aids the reader in understanding context. For example, the size of the bubble could represent sales of a specific product, while the x-axis represents time and the y-axis represents revenue. OK – that’s the basics out of the way. Now, it’s time to move on and impress your peers and clients – and have fun while doing it! The world of data visualization is ever-growing and it’s easy to fall victim to big data trends. 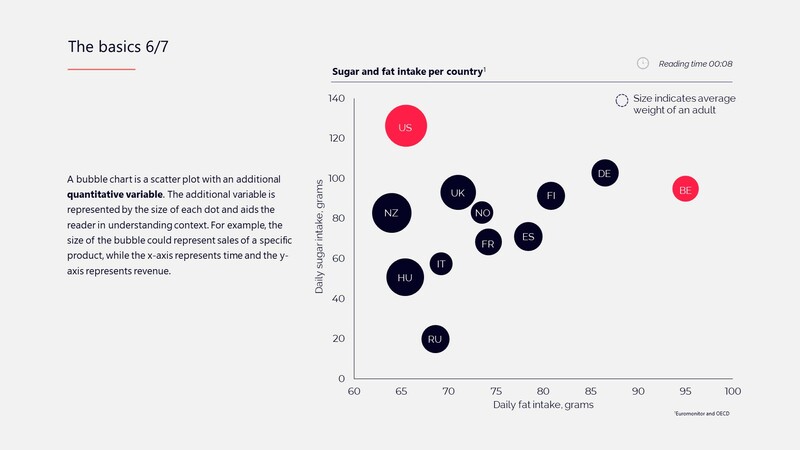 We have all seen the complicated chart with five axes and eight variables; they look cool and make the presenter look clever but (at least sometimes), but often, that’s all they do. The illustration below looks visually appealing and exciting, yet, alone, it makes no sense; it lacks context. This visualization is not helping to sell your idea if you are the only person in the room who intuitively understands it. Your charts, whether advanced or basic, should help aid decisions without becoming too theoretical. It shows how different fractions or components rank and is an excellent alternative to the pie and bar chart. Use it when you want to show how different components make up a total. 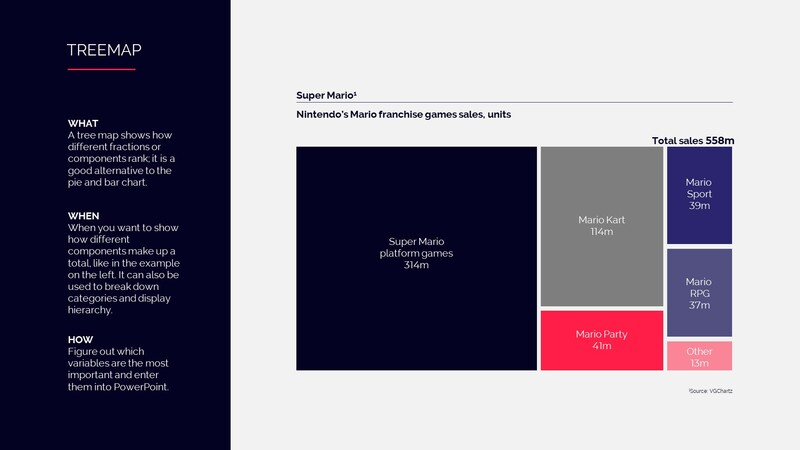 It can also be used to break down categories and display hierarchy. Another example of data visualization for business is the evergreen bubble scatter plot. It's great when you have more than two variables and trends to demonstrate like the example below. 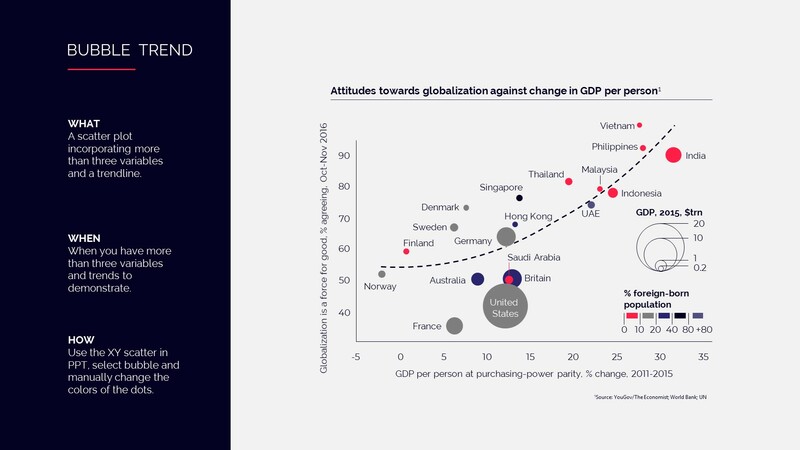 It's an excellent way to show that, on average, the countries who benefit economically from globalization are also positive towards globalization (or countries who are favorable of globalization are more progressive and are getting stronger economies). If you want to dig deeper into data visualization, you can download our ebook on the subject for free. Now that you know the rules of Business PowerPoint Presentation and have a few slides in your basket, it's time to give you the tools that will save you time and make editing faster. All pros use shortcuts and we've made a simple tool that will help you use the most common commands without needing to touch the mouse. Align and distribute using the keyboard only and increase your productivity. 2In the right lower corner, click on ‘Import customization file’ and select ‘NoMore custom ribbon’ from where you saved it. Click ‘yes’ in the dialogue box. 4Now, press alt and shortcuts become visible. Alt + 2, aligns elements to the left. Alt + 3, aligns elements center etc. If you have any questions about the installation process, send an e-mail by clicking here. Want to spend less time formatting slides?